In 1988, as a 25-year scholar at the Bread Loaf writers’ conference, I spotted one of the faculty, a pretty young novelist walking arm in arm with two other pretty young novelists (in fact, Jennifer Egan and Helen Schulman). But it was the one in the middle I called out to for reasons I don’t recall. She turned around. I introduced myself. She said hello and asked, “What do you want to do?” I said, “I want to write fiction.” She looked at me as if I were being silly and said, “You will.” She turned and walked away. I wouldn’t see her again for twenty years. I went on to write non-fiction and books about food and chefs. And then in the fall of 2015, I did indeed publish my first fiction. 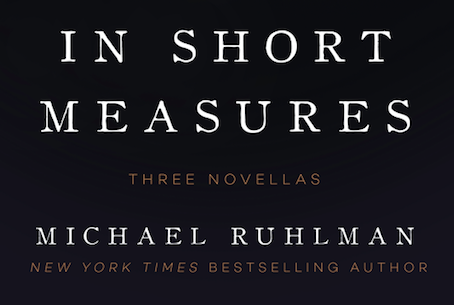 The book, In Short Measures, three novellas, arrives in paperback this week, the week I marry that same woman I’d called out to in Middlebury, VT, Ann Hood. Such great and unexpected changes in midlife don’t come without substantial costs and heartache. But this is life. I don’t know who said it, but they’re right: it’s not for sissies. Indeed, each of the three novellas is about love in middle age, marriages under stress, and the enduring nature of young love within that middle-aged love. Wish me luck my faithful readers and lovers of food and cooking! Congrats, Michael!! Wishing you all the best. Congratulations on the new chapters of your life. Congratulations on your books, your marriage and your leap into fiction! Wishing you all the best! Wow, congratulations to you both– two of my favorite writers! High compliment on the book too. When I read it a I saw some Reynolds Price in there, & that is a very high compliment! Mazal Tov! Wishing you much joy and laughter as you start your new life together. Truly enjoyed the novellas, Milo. Worth the 30 year wait. Wishing you both contentment and joy. What wonderful news for both of you. Congratulations again and … as I said “Don’t look back” …. Congratulations on all fronts!! And might I add, Ann Hood has written what may be one of my all time favorite books, (The Book That Matters Most for those who aren’t familiar with her work.) You’ve got good taste there, Ruhlman. Just received “In Short Measures” yesterday, will be taking it to the Bahamas next week for a beach vacation read. Looking forward to it . . . the vacation as well as the book! Congratulations on your new happiness . . . I can relate (somewhat) to your situation as I’ll be getting married (for the first/last time) later this year at the ripe old age of 62. Never saw this coming, it wasn’t in my life plan, but I’m happier and more content than I’ve ever been. Best wishes to you and Ann! Congratulations! I, as well am on my second act and never happier, as you are. Continued good luck and success. I love your books, and also your travel shows with Bourdain.